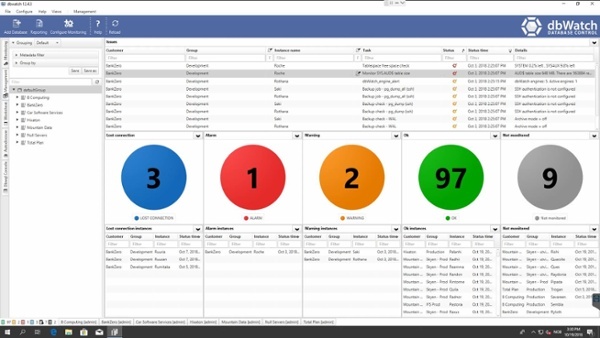 dbWatch is the complete solution for monitoring and managing Microsoft SQL servers. Automate and simplify routine administration and maintenance tasks, monitor system status, server performance and resource utilization. Go from incident-driven to pro-active operations. Experience dramatic reduction in incidents. Full inventory of all your servers, licenses, storage and resource usage. Installs in a few minutes. No agents needed. Read the full product specifications here. dbWatch is a complete cross-platform solution for database management that supports all versions of MS SQL Server from 2000 onwards, AlwaysOn availability groups, Azure SQL, as well as Oracle, MySQL, PostgreSQL and Sybase. Includes more than 60 tasks, checks and reports as standard. Fast, low-risk deployment and minimal resource requirements.